There's more to the bumbo chair than first meets the eye. I bought one in 2000 for my first baby when they had only just been released in South Africa where they originated. I didn't pay much for it and thought it was kind of gimmicky. Boy, was I wrong! Eight years, and three more babies later, I can honestly say it was one of the best baby items I ever bought. You can pick one up for under $40!, and it will last you through all your babies no matter how many you are planning - they are virtually indestructible! The bumbo chair is available with an optional play tray. Well worth the $9.95 price tag! Why Do You Love Your Bumbo Seat? We would love to hear from you. Write a review for us about your Bumbo Seat and we'll add it to the reviews below plus you'll receive a FREE ebook as a token of our thanks. First and foremost, the bumbo seat is light weight and portable. It can be used on any flat ground-level surface and you can take it with you anywhere you go, including the park, beach or lake. You can also take it with you to restaurants and on play dates and visits. I used mine all over the place. The bumbo baby sitter has a hygienic coating that wipes clean easily. There is one continuous surface - no nooks and crannies to get into. The Bumbo Seat is durable. Buy a bumbo baby seat now and use it for your next baby (or two!) I used mine for four babies quite happily. The bumbo chair is easy to store. It's just the right size to slip under the crib, or under a chair in the dining room, which is where I kept mine. The bumbo baby sitter can be used as early as eight weeks or as soon as baby can hold her head up without assistance. Use it until your baby is around 1 year old. There is no weight limit on the bumbo chair so it can be used for as long as baby is comfortable in it or whenever baby starts to get out of the seat on her own. The Bumbo chair is wonderfully versatile. Use your bumbo chair as a baby sitter while you're cooking and cleaning, or as a portable take-along chair. You can talk to your baby, play with your baby, read to your baby and even feed your baby in the bumbo seat. The Bumbo Baby Sitter is safe, comfortable and entertaining for your baby. The bumbo chair is made of low-density, polyurethane foam, making it soft and comfortable for baby. The shape of the bumbo baby sitter places your baby's bottom at a lower level than the legs. This position provides excellent support for baby's spine. Unlike other baby seats, the bumbo baby seat has been endorsed by pediatricians, orthopedists, physical therapists and occupational therapists. Sitting in the bumbo is actually good for your baby's development, whereas extended periods in other baby seats such as carrier seats have been shown to be detrimental to infant development. The front support stops baby from sliding forward giving him a sensation of support and security. Babies get to sit up and look around much earlier than would otherwise be possible. This gives them the opportunity to interact with you and their environment in a new and interesting way. 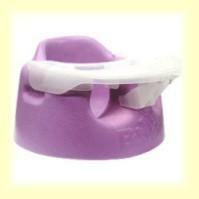 If you purchase the optional play tray, your baby will be able to play with his toys in the bumbo baby sitter too. I had my bumbo baby seat for eight years through four babies and believe me it is perfectly safe if you follow a few basic precautions. Find out about bumbo baby sitter safety here. I hope this page causes you to consider using the ingenious bumbo seat with your baby. Mine gave me hours and hours of happy memories.